I’ve never made a hat before by knitting. It’s supposedly easy, at least according to those who’ve been knitting hats for years. For those of us who’ve never knit in the round before it seems daunting. I don’t quite know how this will turn out. I’m not following a pattern, merely putting one knit-stitch in front of the other until the round of a hat appears. I know that there’s fancy ribbing I could do, all sorts of patterns. I know that hats work better in multiples of eight, for some reason. I know that my own head needs about 24″ around. I have no idea if this hat will meet any of those conditions. 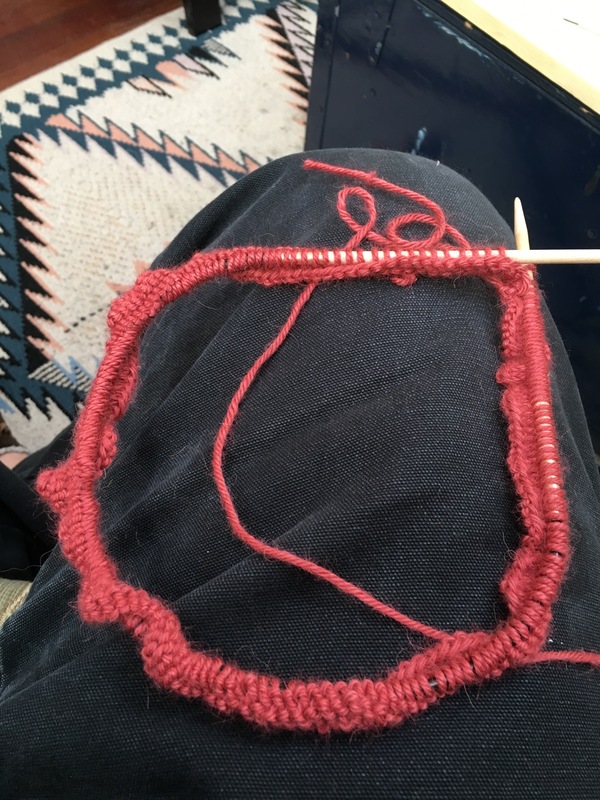 The first condition is to not twist the knit as you work it in the round. The yarn has a tendency to work itself into a spiral as you knit. That’s fine if you’re making a scarf — it’s just straight line after straight line with nary a pun or a punch line in sight. But knitting in the round and not paying attention leads to a twist. And a twist leads to Möbius strips and Klein bottle covers, in knitting. I’ve already completely undone this hat once. I don’t plan on doing so again. Sometimes it’s better to finish a bad hat, and learn from the mistakes, than to start again and again, never going beyond the beginning. I am currently knitting a hat myself. Twists in the first row are annoying, but you’ll still end up with a hat. The one risk is that your all stockinette hat will roll and roll at the edge. So you may have to knit a little longer and end up with a stocking cap! The roll at the edge is of course happening as expected. And so I will wind up with a stocking cap. My next project can have a ribbed edge— but I’m not there yet in terms of skill or design work.